However, 44% of patients in the study presented with severe radiographic osteoarthritis,  which can result in a future need of THA. Further, these patients may complain of lateral hip pain during ambulation as a result of abductor weakness. 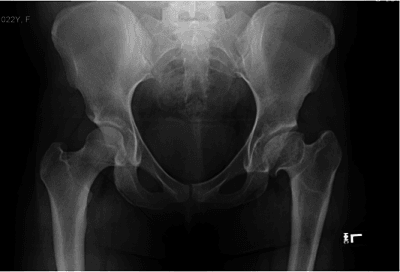 A 22-year-old otherwise healthy woman with history of LCPD presented with hip pain. At age 7, she had been diagnosed with LCPD that was treated with a femoral osteotomy. Over the years, she had some minor problems with her hip, which were better characterized as groin and lateral hip pain after long walks. For the past 2 years, the groin pain has become progressively worse. At the time of presentation, she described her pain as intolerable. Weight-bearing and rotation and flexion of the hip exacerbated the hip pain. She also complained of pain in the lateral aspect of her hip that occurred after long walks. Her ability to walk has been reduced to a few blocks. She described occasional night pain as well. The patient walked with a limp, but did not use any assistive devices. She stated that the symptoms had considerable impact on her quality of life. Figure 1. Standing AP pelvis (top) and abduction view of the left hip (bottom). In some patients, however, non-operative measures fail. We are not aware of any studies reporting on the success of non-operative management of LCPD. Surgical treatment may, therefore, be offered to patients with failed non-operative measures. The surgical option in young, symptomatic LCPD include joint preservation and total hip arthroplasty. The goal of hip preservation surgery in LCPD patients is to prolong the survival of the native hip by addressing the labral tear, the chondral damage, and the morphologic alterations in the proximal femur and the acetabulum. The most important study in this field, which is helpful for decision-making, was presented by Albers et al. They describe an algorithm based on 53 patients (mean age 21 years) who presented with chondral damage of the femoral head. Forty-seven percent presented with acetabular dysplasia, and 55% had radiographic signs of acetabular retroversion. Eighty-nine percent of patients required relative lengthening of the greater trochanter. Despite good overall initial results in the latter cohort, 14% of patients required THA after 5 years, and 39% required THA after 8 years. Interestingly, all the patients included in this study had OA Tönnis grade 0 or 1. Hip preservation is not a viable option for patients with degenerative changes of the hip that correspond to Tönnis 2 or 3 OA. THA is the best option for patients with arthritic changes. The outcome of THA for patients with late LCPD are excellent in terms of survival, without an increased risk of revision when compared with a group of OA hips. A case series from the Mayo Clinic demonstrated that uncemented components had 90% survival at 8 years, while hybrid THA (cemented femoral stem and uncemented acetabulum) had 86% survivorship. The authors reported that femoral and acetabular fractures are complications that may occur during surgery. The pros and cons of hip preservation and THA were discussed with the patient. Because of the severity of her symptoms – including pain in the groin indicative of intraarticular pathology plus Tonnis II arthritis – the decision was made to proceed with THA. The patients did not wish to undergo joint preservation and also was insistent on gaining leg length equality. The patient was also against surgical dislocation of the hip, which would have been needed to advance the greater trochanter, reshape the femoral head, and address the intraarticular pathology. [14,15] She would have also needed reverse periacetabular osteotomy. The outcome of combined pelvic osteotomy, trochanteric advancement, and femoral reshaping is clearly less predictable than THA and is affected by numerous factors, most important of which is the degree of arthritis in the hip. At the latest follow-up of 2 months (Figure 2), the patient is happy with the outcome of surgery and delighted about her equal limb lengths. Figure 2. Postoperative AP pelvis (left) and postoperative left lateral hip view (right). 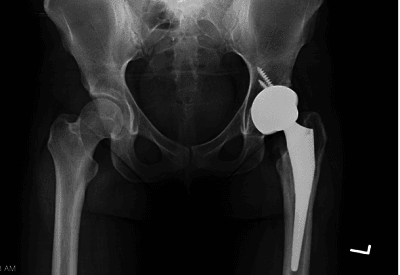 In performing THA for patients with arthritis of the hip as a result of LCPD, the surgeon needs to take into consideration the following issues. These patients often have a considerable limb length inequality, thus lengthening during surgery is required. They should be warned about the possibility of sciatic nerve palsy. Lengthening in excess of 4 cm is not recommended. LCPD patients are often young, and therefore a bearing surface with the potential for the longest survivorship needs to be chosen. The morphology of the acetabulum is grossly abnormal in these patients, and care needs to be taken to avoid over-reaming of the acetabulum in an effort to obtain a hemispherical socket. As with patients with severe dysplasia, the anteroposterior diameter of the acetabulum determines the size of the acetabular component. In some patients with anterolateral deficiency, autograft reconstruction using the femoral head may be needed. In some patients with severely affected proximal femur, the bone in the metaphysis is poor, which poses a challenge with the use of a tapered uncemented stem, as torsional stability may be compromised. We recommend the use of an anatomical fit and fill stem in these patients. It is important to avoid the use of cemented or extensively coated femoral stems in these young patients. Claudio Diaz-Ledezma, MD, is from the Clinical Las Condes, Santiago, Chile. Javad Parvizi, MD, FRCS, is from The Rothman Institute at Thomas Jefferson University, Philadelphia, Pennsylvania. Larson, AN, Sucato, DJ, Herring, JA, Adolfsen, SE, Kelly, DM, Martus, JE, Lovejoy, JF, Browne, R, DeLaRocha, A: A Prospective Multicenter Study of Legg-Calvé-Perthes Disease. J Bone Jt Surg 2012;94:584–592. Clohisy, JC, Dobson, MA, Robison, JF, Warth, LC, Zheng, J, Liu, SS, Yehyawi, TM, Callaghan, JJ: Radiographic structural abnormalities associated with premature, natural hip-joint failure. J Bone Joint Surg Am 2011;93 Suppl 2:3–9. Rhee, PC, Woodcock, JA, Clohisy, JC, Millis, M, Sucato, DJ, Beaulé, PE, Trousdale, RT, Sierra, RJ, Academic Network for Conservational Hip Outcomes Research Group: The Shenton line in the diagnosis of acetabular dysplasia in the skeletally mature patient. J Bone Joint Surg Am 2011;93 Suppl 2:35–39. Clohisy, JC, Carlisle, JC, Beaulé, PE, Kim, Y-J, Trousdale, RT, Sierra, RJ, Leunig, M, Schoenecker, PL, Millis, MB: A systematic approach to the plain radiographic evaluation of the young adult hip. J Bone Joint Surg Am 2008;90 Suppl 4:47–66. Kalberer, F, Sierra, RJ, Madan, SS, Ganz, R, Leunig, M: Ischial spine projection into the pelvis : a new sign for acetabular retroversion. Clin Orthop 2008;466:677–683. Young, EY, Gebhart, JJ, Bajwa, N, Cooperman, DR, Ahn, NU: Femoral head asymmetry and coxa magna: anatomic study. J Pediatr Orthop 2014;34:415–420. Albers, CE, Steppacher, SD, Schwab, JM, Tannast, M, Siebenrock, KA: Relative Femoral Neck Lengthening Improves Pain and Hip Function in Proximal Femoral Deformities With a High-riding Trochanter. Clin Orthop 2015;473:1378–1387. Tönnis, D, Heinecke, A: Acetabular and femoral anteversion: relationship with osteoarthritis of the hip. J Bone Joint Surg Am 1999;81:1747–1770. Albers, CE, Steppacher, SD, Ganz, R, Siebenrock, KA, Tannast, M: Joint-preserving surgery improves pain, range of motion, and abductor strength after Legg-Calvé-Perthes disease. Clin Orthop 2012;470:2450–2461. Clohisy, JC, Nepple, JJ, Ross, JR, Pashos, G, Schoenecker, PL: Does Surgical Hip Dislocation and Periacetabular Osteotomy Improve Pain in Patients With Perthes-like Deformities and Acetabular Dysplasia? Clin Orthop 2015;473:1370–1377. Bozic, KJ: Improving Value in Healthcare. Clin Orthop 2013;471:368–370. Engesæter, LB, Engesæter, IØ, Fenstad, AM, Havelin, LI, Kärrholm, J, Garellick, G, Pedersen, AB, Overgaard, S: Low revision rate after total hip arthroplasty in patients with pediatric hip diseases. Acta Orthop 2012;83:436–441. Baghdadi, YMK, Larson, AN, Stans, AA, Mabry, TM: Total Hip Arthroplasty for the Sequelae of Legg-Calvé-Perthes Disease. Clin Orthop 2013;doi:10.1007/s11999-013-3006-7. Leunig, M, Ganz, R: Relative neck lengthening and intracapital osteotomy for severe Perthes and Perthes-like deformities. Bull NYU Hosp Jt Dis 2011;69 Suppl 1:S62–67. Tannast, M, Macintyre, N, Steppacher, SD, Hosalkar, HS, Ganz, R, Siebenrock, KA: A systematic approach to analyse the sequelae of LCPD. 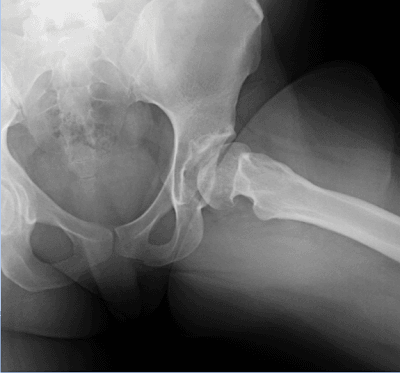 Hip Int J Clin Exp Res Hip Pathol Ther 2013;23 Suppl 9:S61–70. 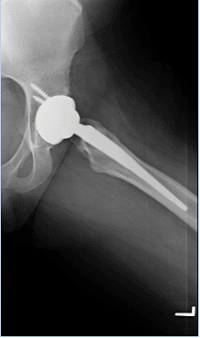 Khanuja, HS, Vakil, JJ, Goddard, MS, Mont, MA: Cementless femoral fixation in total hip arthroplasty. J Bone Joint Surg Am 2011;93:500–509.